Had a silly time making the Halloween-Themed Rice Krispie Treats with my boyfriend Chris last night. We had gotten the supplies over a week ago but I had been busy and putting off making them. I thought tonight will be the night for fun and a potential mess! 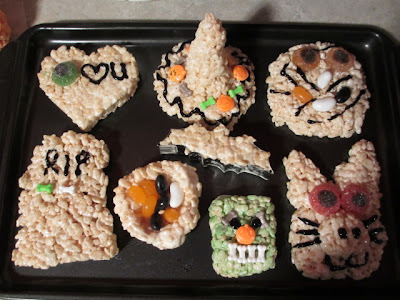 The kit includes a box of Rice Krispies, marshmallows and assorted Halloween candies such as bones, gummy eyes, jelly beans and chocolates. 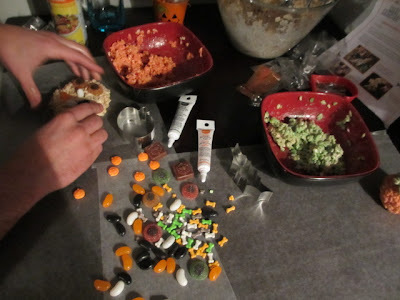 It also came with 2 tubes of icing to decorate with and cookie cutters of a bat and pumpkin. We followed the recipe on the marshmallow bag and decided that we wanted to try and add food coloring to some of it. We used separate bowls to make orange and green Rice Krispie mix. And then the race was on! It was very fun digging in the bowl of gooey-treat-mix (with washed hands of course!) and shaping them into Halloween-y objects. I recommend using spray Pam - LOTS of it! We sprayed our hands throughout the whole creative process and it kept the mix from sticking to our hands and fingers. 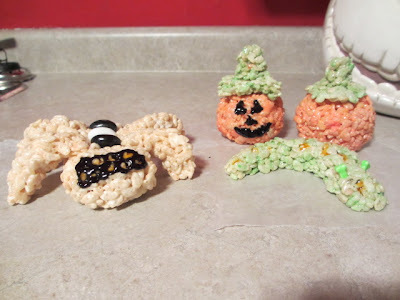 We used the Rice Krispie website for some of the ideas and the rest we invented on our own. And if you messed up or didn't like how something was turning out, you could squish it up and start again! This would be a great/inexpensive way to kill the afternoon with your kids! We were able to be able to make about 12 different designs plus had some to snack on while we were creating! Check out our cool treats!